I love my new apartment and what was really fun was decorating it. I am still slowly working on the putting things up on the wall – but WiseDecor really helped me out in the kitchen. WiseDecor has decorative Wall Lettering that you can personalize. 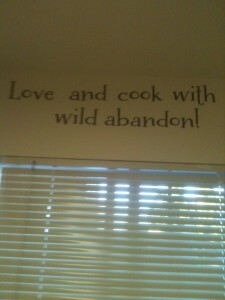 I received this great wall decal and have it above my sink in the kitchen “Love and cook with wild abandon!”. I can see it from the living room when I sit on the couch ~ it always makes me smile. I just love the saying. One of my favorite things to do is cook. Wall decals are the best decorating solution ~ you just peel and place on the wall. It takes only a matter of minutes and the decal peels right off. No damage to the walls. 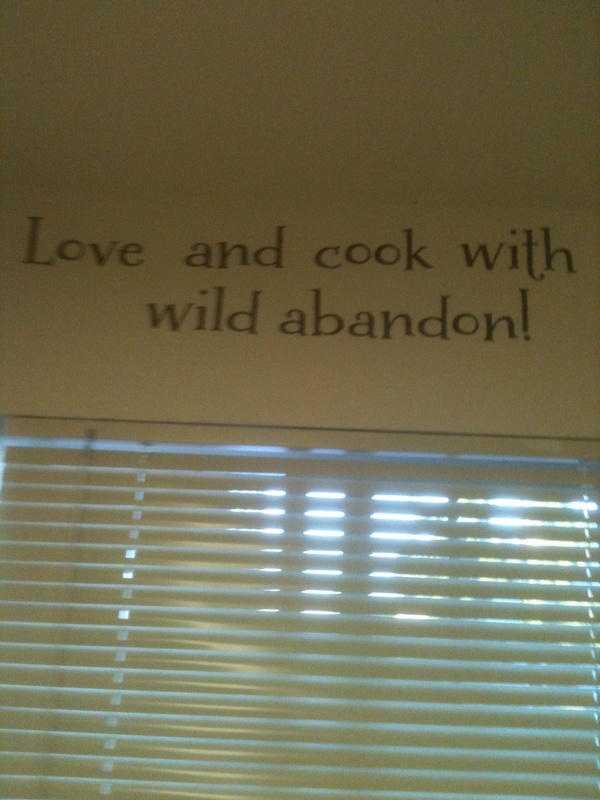 What was great about WiseDecor is I picked out the saying I wanted. Then I went to preview it and I designed my lettering. I could pick out the style of writing, the color, the size and the layout. It was easy and fun to do! The hardest thing to do was deciding on what saying! WiseDecor has a large Quote Library, they have sayings that are spiritual, motivational, hope and dreams and many more. WiseDecor would be great for every room in the house – it would also be great to decorate a dorm room for you son or daughter going off to college. If you would like to order from WiseDecor you can go HERE and browse the large selection of Decorative Wall Lettering. You can also connect with WiseDecor on Facebook. WiseDecor has offered one of my readers the chance to win $50 GC to WiseDecor so you can create your own Decorative Wall Lettering. You must be 18+ and have a US shipping address. Leave a comment on what quote you might pick or what room you would put it in. Extra entry for following WiseDecor on Facebook. Extra entry for each way you follow Kaisy Daisy’s Corner. Giveaway ends Aug 14, 2013.
lokai is all about finding your balance. I find that my life goes in cycles ~ Some days, weeks, months, or years I am on the top of the world everything seems to be going my way. Other days, weeks, months, or years I hit a low nothing seems to work the way I want it too. That is what lokai is about a bracelet that encourages one to be humble through the highs and hopeful through the lows. The bracelet is infused with elements found at the highest and lowest points of the Earth. The white ball is hol ding water from Mt. Everest, the black ball is holding mud from the the Dead Sea. A string of clear beads link the two which shows that each life is its own. The lokai bracelet is a reminder that whether you are at a high or low point you should strive for balance. It is also a reminder that the low points make the high points in your life worth more. Everyone struggles and everyone sores ~ it is how we handle it that makes a difference. Wear lokai to remember that life sees many altering moments – it’s how you process them that matters most. Wear it as a reminder that your path is yours alone, or give lokai to someone who might do well to remember the value of his or her own personal journey. If you would like to purchase your own lokai bracelet you can do so HERE. You can also connect with Iokai on Facebook and Twitter. lokai would like to give one of my readers their own lokai bracelet. You must be 18+ with a US shipping address. Leave a comment on what you do to stay grounded. Extra entry for following lokai on Facebook. Extra entry for each way you follow Kaisy Daisy’s Corner. Giveaway ends Aug 14, 2013. I just love when I find something that is healthy and good tasting. 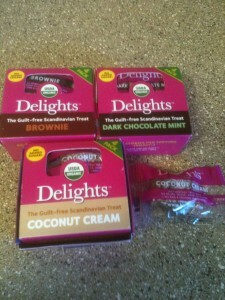 I recently tried Delights™ from kur. The Guilt-free Scandinavian Treat. They are great little snack size treats. They are naturally sweetened with dates and are bite-size so you get perfect portion control ~ they are only 65 calories. Delights™ were created in Copenhagen, Denmark but they are made in the US. They are a top quality product made with simple clean ingredients, healthy and delicious, well-designed, inside and out. 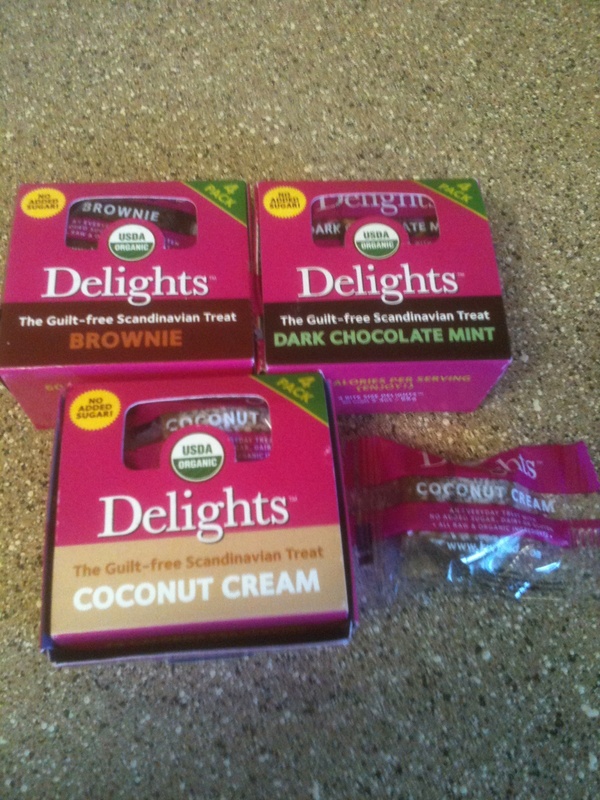 Delights™ come in three great flavors Brownie, Dark Chocolate Mint and Coconut Cream. My favorite is the Coconut Cream. Each one is flavor packed but only contains 4-7 raw organic ingredients ~ no added sugar or syrups. They are pure and healthy. With school starting this would be a great snack to add to your kids lunch. Delights™ are something you can feel good about your kids eating they are organic and a healthy treat. They are good for anyone who wants a healthy snack. If you would like to purchase Delights™ you can do so HERE. 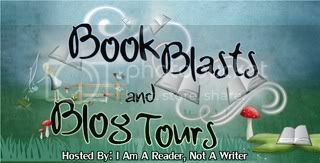 My readers can receive 20 % off an order of $10 or more by using this promotional code: blogdelight1234 You can also connect with Delights™ on Facebook and Twitter. kur has offered one of my readers a Delights™ Variety Pack giveaway for your followers. Our Variety Pack is 3 boxes of 4 Delights™ in each (a total of 12 Delights™) and in all 3 flavors: Brownie, Coconut Cream and Dark Chocolate Mint. You must be 18+ and have a US shipping address. Leave a comment on what flavor you would try first. Extra entry for following KUR on Facebook. Extra entry for each way you follow Kaisy Daisy’s Corner. Giveaway ends Aug 13, 2013. Do you like working outside in the garden? I really do to – but I hate getting my shoes all muddy. I recently found these fun looking Jollys Garden Clogs. Garden Clogs or Shoes are for anyone who likes to work in the garden, around the house or in the garage. They are easy on, easy off. You can leave them by the door and slid your feet in on your way out the door. Out here in Oregon we have rain in the spring and fall so these are great – the mud just rinses right off. They are very comfortable and both men and woman can wear them. Garden clogs offer the durability of work books but feel like you are wearing slippers. Jollys Garden Clogs offer a number of different styles and lots of different colors so you are sure to find the ones for you. 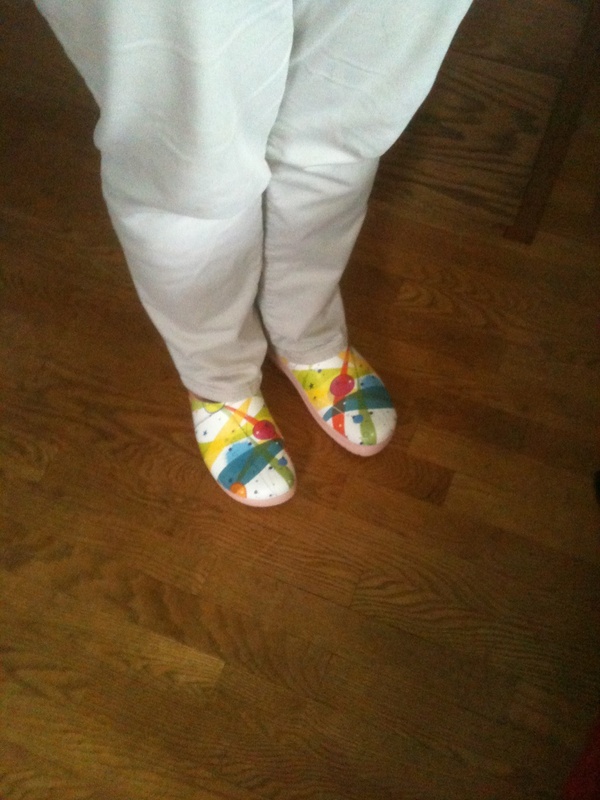 I like the Garden Clogs that had a bit of design on them ~ these are the Abstract design. Jollys Garden Clogs have been the trendsetters among all-weather clogs for over 25 years. Garden Clogs by Jollys are light, flexible, waterproof, and extremely comfortable. The secret is the removable orthopedic insole, made from natural materials. 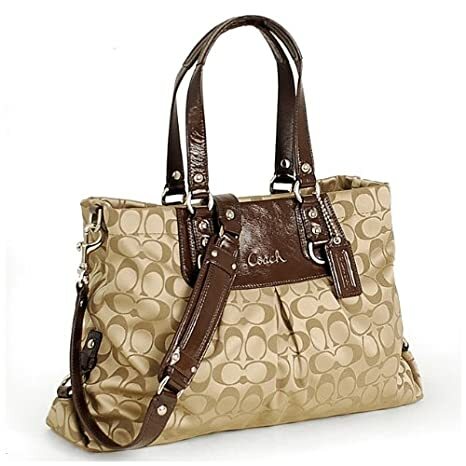 Whether you prefer the classic style or the fashion style there is something for everyone. You can purchase your own Garden Clogs or Shoes HERE. Jollys Garden Clogs has offered one of my readers their own pair of Garden Clogs your choice of style and color. You must be 18+ and have a US shipping address. Leave a comment on when you would wear your Garden Clogs. Extra entry for each way you follow Kaisy Daisy’s Corner. Giveaway ends Aug 13, 2013. I love to cook and because of that I love to try new products. I recently found Two Snooty Chefs which is a premier gourmet seasoning company. They provide high quality products ~ like their unique herb and spice blends which are MSG and preservative-free. 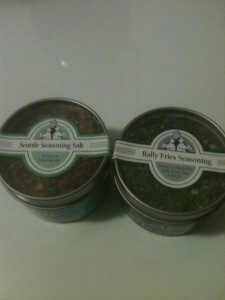 I was lucky enough to try two different seasoning products from Two Snooty Chefs. The first one I tried was the Rally Fries Seasoning. I really loved this garlic, salt and herb seasoning. It tasted really good on french fries and also I used it as a seasoning in the last meatloaf I made. It gave it great flavor! The second gourmet seasoning I tried was the Seattle Seasoning Salt. This is an all purpose seasoning. It has Kosher salt, garlic, herbs, bell pepper and tomato. I used it on potatoes, vegetables and on chicken. It really added a lot of great flavor. They all come in a 4 ounce container – and on the website they all have a recipe with an idea of how to use them. They also offer a full line of Sea Salts & Peppercorns. If you would like to purchase products from Two Snooty Chefs you can do so HERE. You can also connect with them on Facebook. Do you go camping? Do you go to camp sites that don’t have showers? I am not a big camper and one of the reasons is I really like to have showers and wash my hair in the morning. I found something that works great to help refresh your hair with out showering – Bastiste Dry Shampoo. Its is a quick and convenient to give your hair a boost. My hair is pretty fine so I like that Batiste uses rice starch which is lighter and helps give my hair a bit of volume. It’s so easy to use you just hold the can about 12 inches from your hair and spray lightly, making sure to cover hair evenly. Then massage it into your hair with your fingertips. Wait a few minutes and brush. Your hair is revitalized! This would be great to use at the end of the day when you run out of work on to a night on the town to refresh your hair leaving it clean, full of body and texture. It also comes in a variety of different scents. Fresh, Original, Blush, Wild, Cherry , Paisley, Graffiti, Tropical Fragrance. They also have a number of them that are color based options. So as you can see there is one for ever one. I picked the Blush Fragrance and it was very feminine and had a floral scent. So not only did my hair look great ~ it smelled great! If you would like purchase Batiste Dry Shampoo you can do so HERE. You can also connect with Batiste Dry Shampoo on Facebook and Twitter. I really love caramels. I not sure what it is about them but it is one of my favorite candies. I recently found some great ones from JJ’s Sweet Cocomels. They are made using coconut cream. They are so yummy! They are a 100% natural, smooth and decadent. Not only are they caramels but they have a great coconut taste. Different than anything I had tried before. 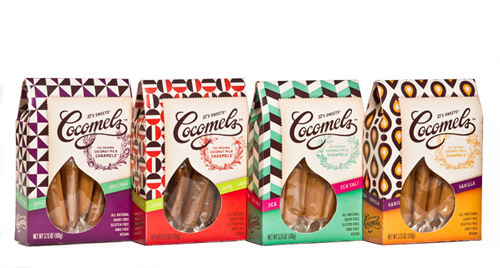 JJ’s Sweet Cocomels come in 4 great flavors the Original, Sea Salt, Vanilla and Java. My favorite is the Sea Salt ~ I love the slightly salty coconut taste. I love how soft, smooth and chewy they are. I really liked all of the flaovrs and would not turn any of them down. JJ’s Sweet Cocomels are still cooked the old fashion way in small batches in copper kettles. They are made with organic ingredients whenever possible and fair trade chocolate. They are vegan, gluten free, corn syrup free, soy free and Non GMO. 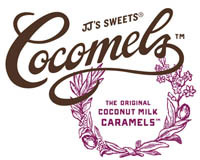 In 2009 JJ made his first batch of Cocomels and had positive reviews JJ’s Sweets was born! Every Cocomel or piece of Unique Hard Candy is a mix of divine inspiration, creativity, love, attention to detail and hard work. JJ Sweet’s take pride in their products and stand behind what they do. If you would like to purchase JJ’s Sweet Cocomels you can do so HERE you can also find them in a establishments in Colorado and California. You can also follow JJ’s Sweets on Facebook. 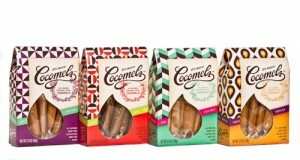 JJ’s Sweet has offered one of my readers all 4 fabulous flavors of Cocomels in Flagship Boxes. You must be 18+ and have a US shipping address. Leave a comment on what your favorite flavor would be. Extra entry for following JJ Sweets’s on Facebook. Extra entry for each way you follow Kaisy Daisy’s Corner. Giveaway ends Aug 12, 2013. Please fill out the form HERE to enter the giveaway. When I do my laundry I want it to smell good right out of the dryer. 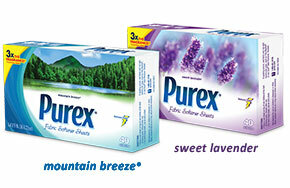 I just recently received the Sweet Lavender Purex Fabric Softener Sheets and they now have 3x the fragrance as before. They come in two great scents the Sweet Lavender I received and Mountain Breeze which I can’t wait to try. I just love how my laundry smells right out of the dryer and I have noticed that the scent last. When I opened the box of Purex Fabric Softener Sheets I could smell the great fragrance – it actually hel ps make my laundry room smell better just by being open. So I decided to tuck a couple in my linen closet in the hall. No reason all my towels and sheets shouldn’t smell good! It’s so nice when I open the door and smell that great Sweet Lavender scent. This weekend I ended up doing major washing including my quilts. 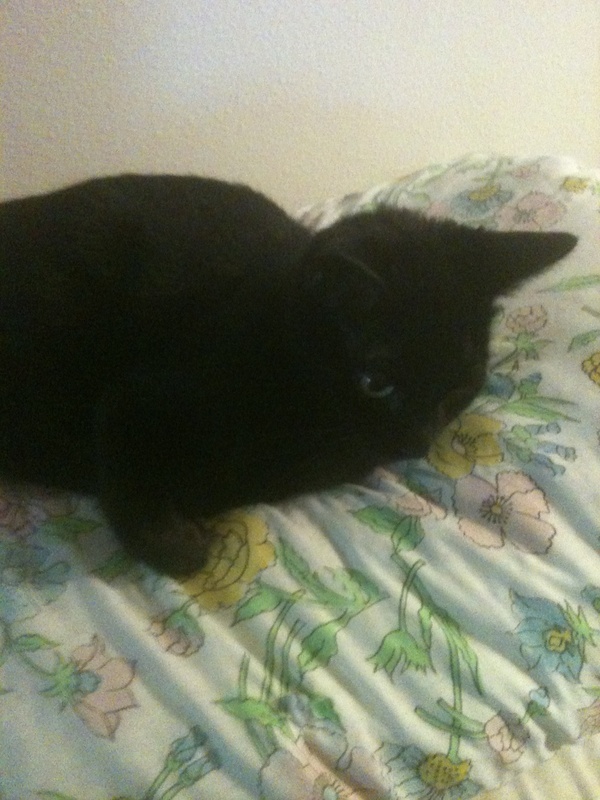 Here is my Shadow laying on my nice clean quilt. I guess she found a new place to lay ~ but the good thing the Purex Fabric Softener Dryer Sheets repel pet hair!! So it was ok for her to take her nap there. They also repel lint, reduce static cling and are a great fabric softener. Purex brand has been around for 90 years inventing and innovating the way we do laundry. Purex has also been a leader in sustainability and developing eco-friendly products. Purex is a brand I trust and like to use. You can find Purex Fabric Softener Sheets and all of the great line of products they have at most stores. If you would like to stay in touch with Purex you can follow them on Facebook. Purex has offered 3 of my readers a coupon for the new Purex Fabric Softener Dryer Sheets. You must be 18+ and have a US mailing address. Leave a comment on what you do with Fabric Softener Dryer Sheets to help something smell better. Extra entry for following Purex on Facebook. Extra entries for each way you follow Kaisy Daisy’s Corner. Giveaway ends Aug 12, 2013.